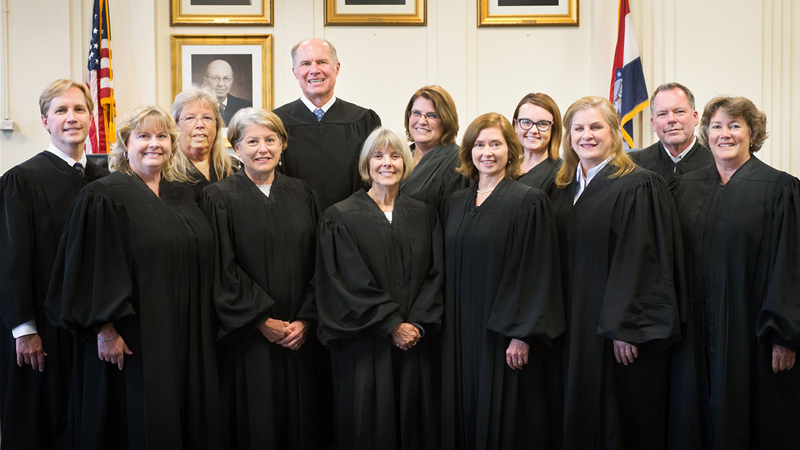 13th Judicial Circuit Judges gathered for a group photo on Aug. 29, 2017. From left: Jeff Harris, Division II; Kimberly Shaw, Division V; Carol England, Division VI; Leslie Schneider, Division X; Michael Bradley, Division IX; Deborah Daniels, Division XI; Sue Crane, Division VII; Sara Miller, Division VIII; Casey Clevenger, Division XII; Jodie Asel, Division IV; Kevin Crane, Division III; and Christine Carpenter, Division I. Division I Circuit Judge – Brouck Jacobs. Elected by Boone and Callaway county voters. Division II Circuit Judge – Jeff Harris. Elected by Boone and Callaway county voters. Division III Circuit Judge – Kevin Crane. Elected by Boone and Callaway county voters. Current Presiding Judge of the 13th Judicial Circuit. Division IV Circuit Judge – Jodie Capshaw Asel. Elected by Boone and Callaway county voters. Division V Associate Circuit Judge – Kimberly J. Shaw. Elected by Boone County voters. Division VI Associate Circuit Judge – Carol England. Elected by Callaway County voters. Division VII Associate Circuit Judge – Sue Crane. Elected by Callaway County voters. Division VIII Family Court Commissioner – Sara J. Miller. Appointed by the Circuit Court En Banc. Division IX Associate Circuit Judge – Tracy Gonzalez. Elected by Boone County voters. Division X Associate Circuit Judge – Leslie Schneider. Family Court Administrative Judge. Elected by Boone County voters. Division XI Associate Circuit Judge – Stephanie Morrell. Elected by Boone County voters. Division XII Drug Court Commissioner – Casey Clevenger. Appointed by the Circuit Court En Banc. See more information about 13th Circuit judges on the 13th Circuit Court’s website. Columbia Municipal Court Judge – Robert D. Aulgur. Appointed by the Columbia Mayor and City Council. Cases are heard at the Columbia Municipal Courtroom, 600 E. Broadway, Columbia. More information about the Columbia Municipal Court. Ashland Municipal Court Judge – Leslie Schneider. Cases heard at Boone County Courthouse. Centralia Municipal Court Judge – Michael Bradley. Cases heard at Centralia City Hall. Hallsville Municipal Court Judge – Ron Sweet. Cases heard at Ashland City Hall. Sturgeon Municipal Court Judge – Leslie Schneider. Cases heard at Boone County Courthouse. Retired judges can be contacted through the courthouses in their counties. Retired Circuit Judge – Christine Carpenter – Boone and Callaway counties. Retired Circuit Judge – Ellen S. Roper – Boone and Callaway counties. Retired Circuit Judge – Gene Hamilton – Boone and Callaway counties. Retired Associate Judge – Christopher S. Kelly – Boone County. Retired Associate Judge – Joe D. Holt – Callaway County. Retired Associate Judge – Cary Augustine – Callaway County. Retired Associate Judge – Robert Sterner – Callaway County. Retired Associate Judge – William Bradley – Boone County. Retired Associate Judge – Deborah Daniels – Boone County. Judge of the U.S. District Court, Western District – Nanette K. Laughrey, U.S. Courthouse, 131 W. High St., Room 307, Jefferson City, MO 65101, phone 573-632-6623. Judge of the Missouri Court of Appeals, Western District – Karen King Mitchell, 1300 Oak St., Kansas City, MO 65106-2904, phone 816-889-3620, fax 816-889-3668. Judge of the Missouri Court of Appeals, Western District – Mark D. Pfeiffer, 1300 Oak St., Kansas City, MO 65106-2904, phone 816-889-3614, fax 816-889-3599. Senior Judge of the U.S. District Court, Western District – Scott O. Wright, U.S. Courthouse, 400 E. 9th St., Kansas City, MO 64106, phone 816-512-5700. Retired Judge of the Missouri Supreme Court – Ann K. Covington, Columbia. Retired Magistrate Judge, U.S. District Court, Western District – William A. Knox. Court-related mail address: U.S. Courthouse, 131 W. High St., Room 204, Jefferson City, MO 65101, phone 573-634-3418.